Tata Motor Group is one of the oldest automobile manufacturing companies in India with its history dating back to year, 1954. This company since then have manufactured and distributed some of the best utility vehicles and other cars in the country’s lucrative car market. Tata Motor Group has a solid reputation of making dependable and trustworthy cars for the global car markets. They are the eighteenth largest vehicle makers across the globe in terms of volume and have always been admired in all the car markets they are present. They have some of the best selling sedans, hatchbacks and some very powerful utility vehicles, which are very prominent across the country for being highly dependable and fuel efficient. There are quite a few Tata vehicles prevailing in the automobile market presently and almost all of them are doing impressive business for their company. Their automobile manufacturing factories in the country are based in various locations such as Pune, Jamshedpur, Sanand, Pantnagar, Dharwad and Lucknow as well. Tata Motors have also acquired some international car brands and are also partners with some other automobile companies as well. They have recently added the new Tata Manza refreshed version to their formidable stables. This elegant sedan, Tata Manza was first launched in year, 2009 and since then have been one of the premium sedans from the formidable stable of the company. Riding high on the success of this charming sedan, the company has now launched a few trims, which are the all new Tata Manza club class editions. The Tata Manza Club Class launch was done very recently and the company is expecting that this sedan will take their sales to the next level. This Tata Manza Club Class launch took place at a plush venue with quite a number of high profile people attending it. The company has equipped this premium sedan with quite a few exciting comfort features, which will certainly impress the buyers. Some of these features included in the Tata Manza Club Class Quadrajet90 EX include an infinity contrast roof, a seven speed front wiper with a smart wipe function, electrically controlled external rear view mirrors, an HVAC with electric controls, power windows , height adjustable driver’s seat and many more such irresistible options. Apart from these convenience features, the all new Tata Manza club class editions are also integrated with some top quality safety features, which are a collapsible steering, central locking, rear door child locks, engine immobilizer and many more such crucial protective features. The engine of this new Tata Manza Club Class Quadrajet90 EX is a 1.3 L common rail fuel supply injection based diesel power train, which is complaint with all the stringent norms of BS-IV and is mated with a ‘C549’ 5+1 speed manual gear box transmission. All these features including the performance packed engine will certainly make this new Tata Manza club class editions, the class leaders in their segment. The designers of the company have done an exceptional job with the outsides of these new Tata Manza Club Class variants. There is quite a number of striking exterior features, which will certainly be liked by the customers. The frontage has been done up with elegance and the radiator grille has four thin horizontal chrome slats and a thick band finished in chrome as well. This has been integrated with a large and prominent badge of the company. The front body colored bumper is integrated with a pair of bright fog lamps that have chrome strip surrounds around it and has a big air dam with two slats, which further enhances the cooling of the powerful diesel engine. This bumper has also been fitted with body colored rub rails with chrome inserts for added protection from minor scratches. The large head lamp cluster is quite big and very radiant, which is equipped with high intensity motorized clear lens head lights. These head lamps also have the follow me home function for added convenience for the passengers. The front wind screen is pretty big and gives the driver a better view and is fitted with a pair of seven speed front wipers, which also has a smart wipe function for better cleaning of the glass. The side profile gets the standard body color external wing mirrors along with body colored pull type door handles. The wing mirrors are power adjustable, while the Tata Manza Club Class Quadrajet90 EX also has body colored door rub rails that have chrome inserts, which add to the grace of the silhouette and also avoids any minor damage to the doors. The astutely carved out wheel arches have been fitted with an elite set of 15 inch, 8 split spoke light alloy wheels of size 5.5 J x 15, which are covered with sturdy tubeless radial tyres of size 185/60 R15 and have a superior road grip on any road conditions. The rear end gets a large wind screen, which has been integrated with a rear demister. The rear body colored bumper has been integrated with a pair of radiant fog lamps, while there is a chrome garnish on the license plate fixing slot. The roof of this Tata Manza Club Class Quadrajet90 EX gets a unique infinity contrast and is also fitted with a smart and trendy external roof mounted antenna as well. On the whole, the dimensions of this Tata Manza Club Class Quadrajet90 EX are quite liberal to accommodate five passengers very comfortably. The total length of this Tata Manza Club Class Quadrajet90 EX is about 4413mm along with an overall width of 1703mm, which also includes the external rear view mirrors. The total height of this premium sedan is about 1550mm and it has a roomy wheel base of close to 2520mm, which is quite large. This impressive sedan has a hefty luggage compartment that can accommodate close to 460 litres, while the centrally mounted fuel tank can take in approximately 44 litres of diesel in it. The Tata Manza Club Class Quadrajet90 EX has a kerb weight in the range of 1200 to 1210 kgs, which is rather remarkable for a slender sedan. The company is offering the Tata Manza Club Class Editions in quite a number of vibrant and attractive metallic exterior paint options. These exterior paint options are a stylish Tyrian Wine lower body finish with a Black colored roof, an elegant Dew Pearl White that also has a metallic black roof top finish, a graceful yet subtle Jet Silver with a Black roof top, a magnificent Infinity Black with a Silver colored roof top finish, a flamboyant Laser Red metallic finish with Black Roof and also a lovely Castle Grey metallic finish, which gets a Black colored roof top finish. The Tata Manza Club Class Quadrajet90 EX is one of the top end versions in the model lineup and the company has bestowed this sedan with some luxuriant and very comfortable interior aspects. To begin with the seating arrangement is extremely lavish with well cushioned seats, which are covered with premium quality Italian leather upholstery with an overall black and plum interior color scheme. The internal door handles are finished in chrome and so is the gear knob, which has chrome inserts. The power steering wheel can be adjusted and is covered in leather along with the gear shift lever and the hand brake as well. There are quite a few storage spaces inside this premium sedan, which will further add to the convenience of the passengers. This Tata Manza Club Class Quadrajet90 EX has storage space in the front as well as the rear doors, a storage tray under the front co-passenger seat, a large glove box that has a card as well as a pen holder. This premium sedan also has a power outlet in the front, while the ignition keyhole ring is illuminated for the driver to see in the dark. The instrument cluster is bright and has a wide variety of warning and notification lamps to keep the driver up to date with all the vital statistics of this premium sedan. There is also an internal day and night anti glare rear view mirror, front and rear cabin lights, a bottle holder on the front console, an adjustable arm rest for the rear seat passengers that also has a cup holder, adjustable head rests for the front seats, a two way adjustable lumbar support for the driver’s seat, while the front co-passenger seat gets fixed lumbar support. All these and many more such highly developed and exciting features make this all new Tata Manza Club Class Quadrajet90 EX, one of the most remarkable premium sedans in the country. Tata Motor Group has fitted this amazing Tata Manza Club Class Quadrajet90 EX premium sedan with a power packed 1.3 L diesel mill. This power plant is fitted with 4 cylinders and has a common rail injection based fuel supply system , which aids in better fuel efficiency . This diesel power train can displace close to 1248cc and has the ability to generate a peak torque output of 200 Nm at 1750 – 3000 Rpm in combination with a maximum power yield of 88.2 Bhp at 4000 Rpm, which is rather good for the Indian traffic conditions. This performance packed engine is complaint with all the strict norms of Bharat Stage IV and the emission levels are lesser. The Tata Manza Club Class Quadrajet90 EX is cleverly mated with a smooth and efficient C549 – 5+1 speed manual gear box transmission. The all new Tata Manza Club Class Quadrajet90 EX is fitted with a proficient braking mechanism along with a stable and well balanced suspension system, which helps in keeping this premium sedan stable and in control of the driver. The braking mechanism of this sedan is a vacuum assisted independent dual circuit that is diagonally split with hydraulic brakes through a tandem master cylinder. The front wheels of this premium sedan are equipped with ventilated disc type brakes, while the rear wheels get drum type efficient brakes. This premium sedan is also incorporated with the advanced antilock braking system along with electronic brake force distribution system for better and enhanced braking of this sedan. Then again, the front axle of this Tata Manza Club Class Quadrajet90 EX is fitted with an independent lower wishbone along with a McPherson strut that has a coil spring. Whereas, the rear axle is equipped with a semi independent twist beam, which has coil springs along with hydraulic shock absorbers. All these put together ensures that this premium sedan is in control and gives a delightful driving experience to all the occupants. The company has integrated quite a number of advanced and highly developed safety features in these all new Tata Manza Club Class Editions. These features include a collapsible power assisted rack and pinion steering for better maneuverability and handling, high mounted stop lamps for improved visibility to the other car drivers, rear door child locks for added security for the children, engine immobilizer, a remote controlled keyless entry with central locking for superior protection of this sedan, a warning buzzer for the driver door being open along with an key, head lamps, tail lamps on warning lamp, ABS with EBD for enhanced braking on any surface, dual front SRS airbags for the driver as well as the front co-passenger for additional protection against any crash or accidents, front seat belts are equipped with retractors, pretensioners as well as load limiters for better control and comfortable drive. All these crucial and highly advanced features put together makes this Tata Manza Club Class Quadrajet90 EX, one of the safest sedans in the Indian car market. 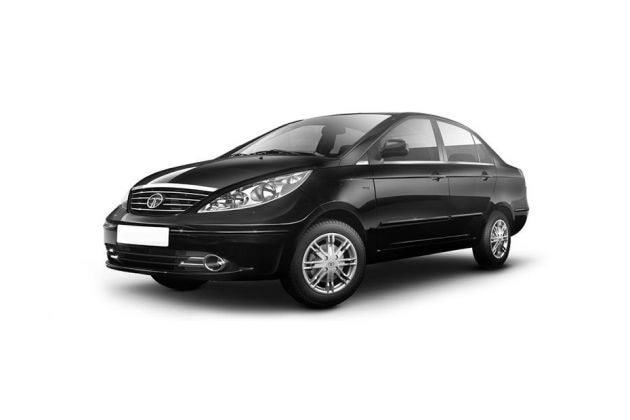 The Tata Manza Club Class Quadrajet90 EX is one of the top end trim in the model lineup and the company has blessed it with some of the best in class and exciting comfort features. The inventory of these impressive features comprise of a highly advanced two din audio system that has an MP3 player along with a FM Radio with a playback and an audio equalizer. This sophisticated music system has varied input options such as a USB interface along with an Aux-In port as well. This audio system has been equipped with an infrared remote control and it also has 2 speakers in the front doors along with a pair of speakers in the parcel tray and two tweeters as well. This premium sedan also has a satellite navigation system, Blue5 technology for pairing the mobile phones, steering mounted audio and phone buttons for enhanced comfort for the driver. This premium sedan also has a sophisticated driver information system with a digital clock, fuel consumption along with distance to empty display, an ambient temperature indicator and other such notification lamps. There is a powerful and efficient HVAC (heating, ventilation and air conditioning) unit, which cools the entire cabin within no time and has electric controls to it. This premium sedan also has all four power windows with a one shot auto down for the driver side window. All these and many more such exciting features of this Tata Manza Club Class Quadrajet90 EX makes it one of the most luxuriant sedans in the car market. Striking exterior features, advanced and convenient interiors, powerful engine with a good pickup. Mileage can be increased and the engine noise, vibration and harshness can be reduced. Tata Manza is available in 3 different colours - Dew White, Jet Silver, Infinity Black.